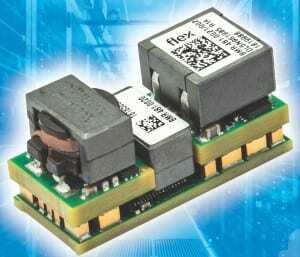 Flex Power Modules has introduced its first generation of Direct Conversion products to address the growing need for higher energy efficiency levels in data center and cloud computing infrastructure. The new BMR481 dc-dc converter has an input range of 40-60V targeting 48-54V nominal supplies, and a programmable 0.5-1.35V output. The 12 x 27.7mm footprint ‘main’ module provides a maximum output current of 70A and also incorporates a digital interface for monitoring, configuration and control purposes. This main unit can then be supported by up to 5 additional ‘satellite’ modules, resulting in a total current rating that reaches 420A. At 53V input and 0.5V output, the full 70A output current is available from the main module to over 75°C ambient temperature with 0.5m/s airflow and to over 90°C with just 2m/s airflow. Full digital control is implemented with a PMBus v1.3 interface compliant with PMBus or AVS / SVID. Isolation is rated at 1500Vdc (functional). 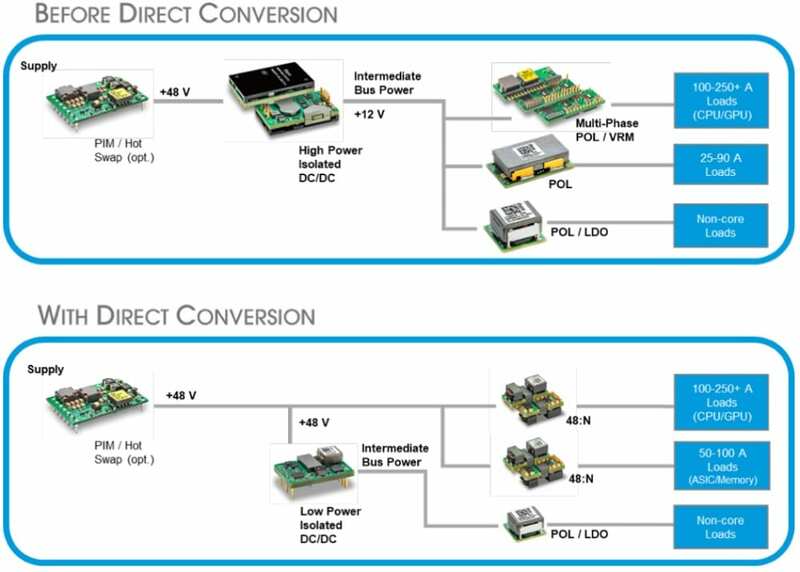 The single-stage BMR481 provides an attractive alternative to the conventional two-stage intermediate bus converter (IBC) and point of load (POL) architecture – where an extra conversion step is required, which thereby takes up greater space and impacts operational performance. BMR481 ‘main’ module. The ‘satellite’ modules have the same form factor, but do not include the bottom PCB which contains the digital interfacing and configuration functions. In contrast, this new groundbreaking Direct Conversion module presents engineers with a far more streamlined and economical solution. It is capable of achieving up to 92% efficiency from a 1V output at 53V in – which is 2-3% higher than what an equivalent IBC-based deployment can deliver. It also allows a reduction in board area of up to 50%. MTBF is in excess of 8.7Mhrs for the main module. Optimized efficiency is achieved by automatic enabling and disabling of phases/satellite modules depending on the required load, along with dynamic voltage adjustment to provide optimum supply rails to connected ICs. Output ripple and noise is extremely low, typically 1mV p-p, due to the zero voltage/zero current switching employed. Load and line regulation are typically kept to just 1mV. Olle Hellgren, Director Product Management and Business Development at Flex Power Modules, commented: “Direct Conversion will be pivotal in stopping data center capital and operational costs from spiraling, as well as enabling increasingly stringent energy efficiency guidelines to be met. This is being made possible by eliminating the 12V intermediate level conversion stage in order to boost efficiency, along with utilizing less board space. “With the BMR 481, Flex is pushing forward the proliferation of Direct Conversion, and demonstrating the huge potential of this new power conversion architecture,” Hellgren concluded. The BMR 481 is currently being sampled by key customers.